Where the gamers go to game: upstairs at Endgame's retail shop (via Facebook). Even as Old Oakland’s dining scene has blossomed in the past few years, a cup of coffee and a quick, inexpensive bite to eat have remained rare commodities, at least in the evening hours. Chris Hanrahan, the co-owner of board game store EndGame (921 Washington St.), explained that the neighborhood’s coffee shops and casual takeout joints all close at around 7 p.m. — much to the chagrin of the hungry, undercaffeinated souls who flock to Hanrahan’s store multiple nights a week for Dungeons and Dragons or Magic: The Gathering. So Hanrahan and his partners took matters into their own hands. When EndGame renewed its lease recently, the owners jumped at the opportunity to expand into the vacant 1,000-square-foot space next door. After completing a successful Kickstarter campaign, they’ll soon open EndGame Cafe, an extension of their retail store that they hope will serve a dual role: It will be a place to get that elusive late-night cup of coffee, but EndGame’s owners also envision it becoming a hub for the Bay Area’s geek community. Hanrahan said he and his fellow co-owners decided that they didn’t want to open a traditional board game cafe, in which providing a place for customers to play games would be the exclusive emphasis. With 2,200 square feet of existing gaming space spread across a sprawling mezzanine level at the original retail store, “we lack no space to play games,” Hanrahan explained. So he and the other owners decided to expand their focus to other “geek events,” including improv nights, readings, and concerts by popular geek bands. A stage will be a set aside for those events. In short, “It will be a place to come and do fun ‘geek’ things,” he said. 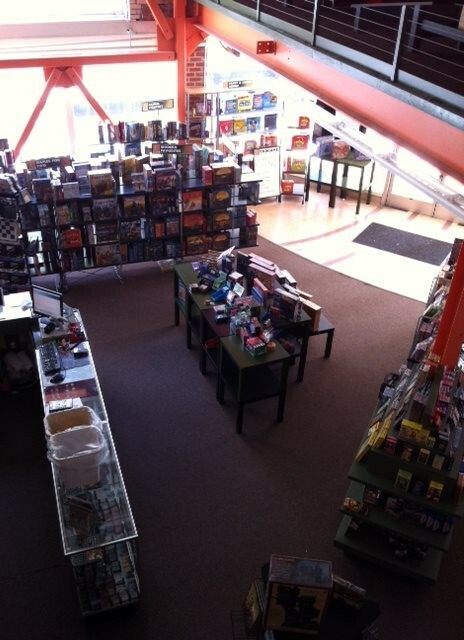 View of EndGame's retail store, circa 2012 (via Facebook). Which isn’t to say that board games won’t play a role. Hanrahan said there will always be a selection of popular games available for cafe customers to try out, free of charge, while they sip their lattes. Indeed, he said that one of the cafe’s goals is to provide a safe space for newcomers who have been curious about some of the newer, European-style board games or war strategy games, with their hand-painted miniature figurines, but have perhaps felt too intimidated to try playing them on their own. “We want to be that bridge,” Hanrahan said. 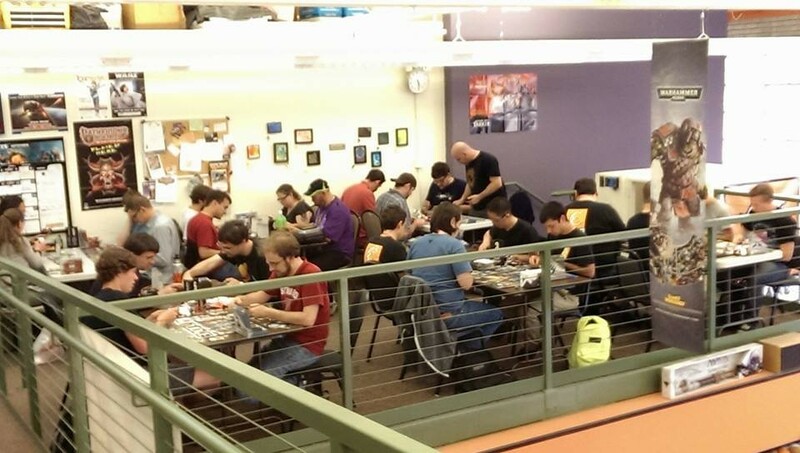 That outreach mentality is nothing new for EndGame, which has hosted a wildly popular, free, and open-to-the-public Board Game Night on Wednesdays from 6:30 p.m. to midnight, for the past thirteen years. For many board game aficionados, the weekly event has served as an introduction to the East Bay’s broader gaming community. In part, the new cafe will function as a place where game night regulars can pick up a quick peanut butter and jelly sandwich before settling it for a night of Warhammer or Settlers of Catan. But Hanrahan hopes that non-gamers, who might initially come just for the coffee, will be drawn in by the lively scene next door — that future Board Game Nights will get an influx of new, casual gamers. The owners are serious about wanting to offer good coffee, too, choosing not to go with some generic, big-box roaster. Instead, EndGame will be one of the first Bay Area cafes to use beans roasted by the Berkeley-based Supersonic Coffee, a relative newcomer to the “third wave” coffee scene. Food will be relatively simple cafe fare, with pastries provided by a local vendor and soups, salads, and hot and cold sandwiches made in house — none of it so complicated that it can’t be assembled at a counter, since kitchen equipment will be fairly limited. Construction is underway, with the opening expected sometime in February. While the exact hours are still to be determined, Hanrahan said the cafe might open as early as 8 a.m. and stay open until around 10 p.m., when most of the events at the retail store start to wind down.